Claude Arpi: Will the IAF not get its Rafales? With the Rafale fighter deal stuck over price, can the prime minister step in and find a way out for both countries? Claude Arpi examines the issue. Well, it is a melting iceberg, with the Indian fleet rapidly reducing. The Air Chief admitted: “The IAF has flagged concerns about the shortage of fighter jets and the process for the acquisition of 36 French Rafale fighter aircraft is still underway." Let us do a flashback to January 25, 2016. As Manohar Parrikar, the Indian Defence Minister and his French counterpart Jean-Yves Le Drian signed a MoU for the purchase of 36 Rafale aircrafts, President Hollande of France said, in front of the national and international media in Hyderabad House, that the ‘real’ deal would be inked ‘dans les jours prochains’ (‘in the coming days’). Later Dassault Aviation, the aircraft manufacturer, clarified that it would take about 4 weeks. The French officials, including Le Drian, accompanying the French President during his State visit were quite optimistic that this could be done. News appeared that Dassault would have quoted around $9 billion for the 36 jets while South Block was expecting a much cheaper price. The final deal would include two types of missiles and bombs, training of pilots and two base facilities for the planes. Incidentally, the latter creates a huge problem for the French Air Force (FAF), already overstretched with a growing number of overseas military interventions and a shrinking budget. 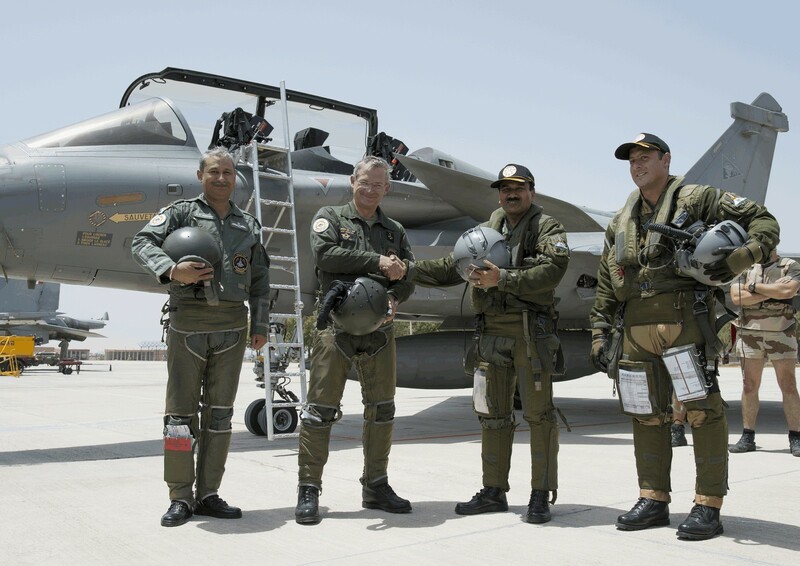 The Rafale deal, if it comes through, like the previous ones signed with Egypt and Qatar, is not a boon for the FAF, which will be responsible for the training and setting up of the bases. It will however be a huge success for the rather unpopular French President …and France’s economy. As talks were going on, a report in the Indian press pointed out to several loopholes, apparently earlier overlooked by the Modi Sarkar. The Union Law Ministry would be objecting to some clauses in the January MoU; they could 'compromise' India’s interests, it says. But first let us recall that the initial Request for Information had been issued in 2001. Fifteen years ago! The Request for Proposal (RFP) was only issued in 2007, as the then minister, AK Antony wanted to add new clauses, such as the Total Life-cycle Costs, in the Indian defence procurement policy. The ‘complications’ had started. Finally, in January 2012, the French firm Dassault Aviation was selected for supplying 126 planes to the IAF. In April 2015 in Paris, realizing the difficulty with the transfer of technology to Hindustan Aeronautics Ltd and to avoid going back to the starting blocks, Mr Modi opted for 36 ‘off-the-shelf’ planes only. The French had probably not realized that ‘off-the-shelf’ can be rather complicated in India. The main sticking points raised by the Law Ministry, touched upon the issues of liability, bank guarantees, arbitration and a higher-than-usual offset clause. For the bank guarantees too, The Indian Express’ source asserted that the French government has refused to give any bank guarantees; instead, it has offered to provide a ‘comfort letter’ from its Prime Minister. It is apparently what was accepted during Hollande’s visit to Delhi in January. The babu’s mindset is also manifest when it objects that while the deal had agreed on Geneva (Switzerland) for arbitration proceedings, the MoD should have pressed for having India as the seat of arbitration. All this just shows the babus’ deep frustration: they had not been kept in the loop; as a matter of fact, it was precisely why the Prime Minister decided for an ‘out-of-the box’ solution for 36 instead of 126 jets. On March 10, Defense News, a usually well-informed website, reported that Dassault Aviation was negotiating with Delhi the possibility to build 90 more units with potential local partners. The website quoted the French company’s chairman Eric Trappier: “Dassault seeks to set up ‘a real partnership’ with Indian industry rather a conventional offset, which requires investing in unrelated sectors. That partnership approach would see Safran, Thales and other French suppliers working with local partners on the Rafale if New Delhi agreed the order for 36 and followed up with a further 90 unit. That second order was needed as the former figure was too small to justify a local build.” In other words a ‘Make in India’ scheme! In the meantime, Dassault is talking to Canada, which may drop out from the F-35 program with the US and also Switzerland trying to replace its F-5 and F-18, as well as Belgium, the United Arab Emirates and Malaysia. The problem for India, as well as for other potential buyers, is that the annual output of the assembly line of the Rafale’ workshop near Bordeaux is 11 units, or one a month, (in August, France does not work! ); the output could rise by three units, if India and other countries signed up for the fighter, explained Mr Trappier; further Dassault needs to deliver six Rafales to the FAF in 2016 and one in 2017. A few days later, while confirming that the Rafale deal with Dassault was still on, Mr Parrikar boasted to be a ‘tough negotiator’ wanting the ‘best price’ for Rafale fighter jets. It is fine to be a tough negotiator, but Mr Parrikar should not forget that Dassault too is a hard bargainer. Further, the position of the French consortium is not the same as two years ago: Their order-book is full and first ordered, first served, remains the rule. It is clearly a poker game, with each party sending ‘feelers’ and vague threats though the media. But who would be the loser if the deal does not come through? Undoubtedly both France and India, particularity the IAF, with Air Chief Raha’s melting iceberg melting further due to the change of ‘bilateral’ climate. Quite-worryingly, some news, which passed unnoticed in India, created waves in France: it is the awarding of the Legion d'Honneur, the country's highest honour, to Saudi Crown Prince Mohammed bin Nayef. It sparked a huge controversy in France, which Jean-Marc Ayrault, the newly-appointed foreign minister tried to justify: “It's a diplomatic tradition …there was ‘nothing grandiose’ about the ceremony;” but Saudi Arabia remains one of the world’s worst human rights violator (and suspected by many of financing the IS). The website Intelligence online had perhaps the answer. In January, it titled: “Riyad wants to lure Paris with a contract for the Rafale”. It quoted a source saying that Prince Mohammad bin Salman, Saudi Arabia’s Defense Minister, appealed to Paris to submit a proposal for the supply of fighter aircraft Dassault's Rafale ‘in the coming weeks’. Are 72 jets not worth a small medal? And if the Prince decides, there is no babu in Ryad who will block the contract …and no problem of cash either. That would mean that the ‘Indian deal’ is further postponed for several years. Let us hope that once again the Prime Minister will step in and find a way which will be a win-win solution for both countries.